For over 35 years, Intertex Textiles Inc. has been Canada’s leading supplier of heat resistant industrial textiles, as well as Canada’s most innovative and successful manufacturer of heat resistant protective apparel. Intertex’s success comes from our expertise & knowledge of heavy industry applications, as well as our consistent customer oriented service. Intertex’s heat resistant textiles are designed for use in extreme heat or cold industrial applications where equipment and/or personnel require protection or insulation. Protective curtains, damage control blankets, metal splash barriers, welding blankets, safety clothing, insulating sleeving & pipe wrapping, & removable insulation covers are a few of the applications our Industrial Textiles are used. 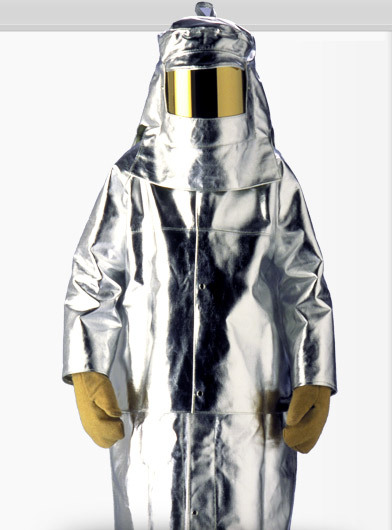 Intertex safety clothing is designed to provide head to toe protection from molten metal, radiant heat, ambient heat, molten glass, and sharp flat & architectural glass. Our designs are based on over 35 years of experience to provide our customers with safety clothing that provides comfort and reliability in some of the world’s most extreme industrial work places. As a manufacturer of heat resistant & industrial safety clothing, Intertex is able to offer customized designs, superb quality, and quick turnaround of orders. Our Safety Clothing is also proudly Made In Canada, something we and our customers take pride in. Industries served included Steel making, Foundry/Die Casting, Insulation Contracting, Welding, Safety clothing manufacturing, , Petro-Chemical, Aviation, Architectural Glass Manufacturing, Glass blowing, and Automotive. We can assist you in making technical decisions for your unique application.